Simply His Servants (or SHS for short), Cleveland's only regular, year-round Rocky Horror floorshow cast, has been a well-known and well-received mainstay in the RHPS scene for more than a decade. 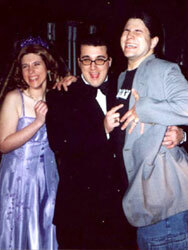 SHS started at the Cedar Lee Theatre in Cleveland Heights, OH in late 1994. They still perform at the Cedar Lee today, on the first Saturday of every month at Midnight. SHS has the usual sold-out Halloween shows, and like other RHPS casts, has its own fun theme nights, including Cast Switch Night, Prom Night, Beach Party Night, and Pirate Night. They have even done "double feature" shows to packed houses, featuring both RHPS and Shock Treatment. RHPS casts from all over come to visit SHS' shows, including the Columbus, OH cast The Fishnet Mafia. The Cedar Lee also shows cult cinema classics on the same night as SHS' show. "...Remember that even though we are at the show all the time, the backbone of the show is YOU: the audience. Without the audience, there would be no show, and each show is only as good as we all can make it." Directed by Kev J. Boycik and Kimmy Woodworth, Simply His Servants is always accepting applications for auditions, to add to the members of their crazy RHPS family.